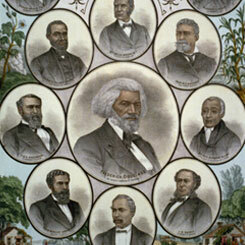 Image courtesy of Library of Congress This 1882 print of “Distinguished Colored Leaders” featured Preacher Henry Garnet among notables such as Representative Joseph Rainey of South Carolina, Representative John Langston of Virginia, Senator Blanche K. Bruce of Mississippi, and Frederick Douglass. On this date, Preacher Henry Highland Garnet became the first African American to speak in the House Chamber when he addressed a crowd of worshippers. A common practice for the period, the House Chamber was often used by large groups in the Capitol Hill area when the House was not in session. House Chaplain William Henry Channing invited Garnet to commemorate the House’s approval of the 13th Amendment abolishing slavery. Garnet spoke to a crowded chamber complete with a choir from his Fifteenth Street Presbyterian Church. While a religious sermon in context, Garnet challenged Congress to “Emancipate, Enfranchise, [and to] Educate.” Of slavery, Garnet said, “Upon the total and complete destruction of this accursed sin depends the safety and perpetuity of our Republic and its excellent institutions.” Prior to Garnet’s sermon, African Americans had been banned from both congressional chambers since the late 1820s. In 1869, John W. Menard became the first black man to address a session of the House in his contested election case. In 1871, Representative Jefferson Long of Georgia became the first black Member of Congress to address the House in session, when he opposed an Amnesty Bill granting Confederates full political rights.